Using the EAGALA Model, Berkshire HorseWorks offers 60 or 90 minute sessions for individuals, couples, groups, families, customized short and long term programs commensurate with delineated treatment goals. We also offer half-day and full-day sessions. Equine Assisted Psychotherapy is a powerful and effective therapeutic approach that has an incredible impact on individuals, at-risk youth, couples, families, and groups, as well as on active duty military and veterans. EAP addresses a variety of mental health and behavioral challenges ranging from autism, PTSD, sexual abuse, trauma, addiction, ADHD, eating disorders, depression, anger management, and anxiety, to boundary issues, relationship problems, effective communication, resiliency, and reintegration. “Because of their size, acute sensitivity and history with humans, horses have a unique appeal worldwide, helping clients become more engaged in the therapeutic process,” said Lynn Thomas, EAGALA’s Executive Director and co-founder. “The EAGALA Model has a solution-focused, client-centered approach believing clients have the best solutions for themselves when given the opportunity to discover them. Coupled with the nonverbal nature and appeal of horses, the Model has expanded globally crossing cultures and languages and addressing issues indigenous to a respective population,” she added. 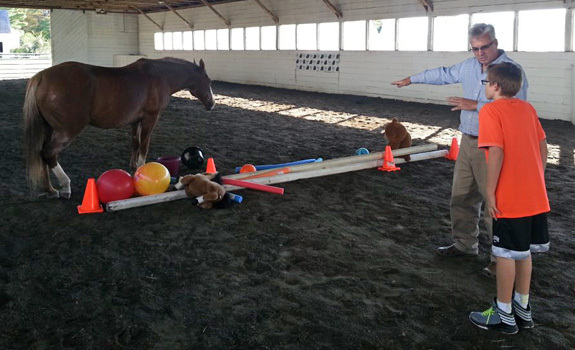 “Berkshire HorseWorks has quite literally been life changing for my son. The confidence and self worth he has acquired from these magnificent animals is truly remarkable. To be able to see this transformation before our eyes was a magical experience. Hayley, and Dom are earth angels, the kindness, and patience they’ve shown will leave an impression for a lifetime,” shared Gisela Kearns. Horse therapy, according to a growing number of mental health professionals, can be significantly more productive than talk therapy. According to the RAND report (April 2008), nearly 20 percent of military service members who have returned from Iraq and Afghanistan — 300,000 in all — report symptoms of post traumatic stress disorder or major depression, yet only slightly more than half have sought treatment. “Horses are the best therapists for many veterans, because most vets don’t want talk therapy,” says Julie Giove Sardonia, MA, LMFT, a therapist in California. “Healing happens in nature, especially for the military. 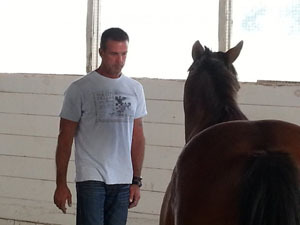 Equine sessions, as opposed to traditional talk therapy, are more impactful and shorten treatment time. 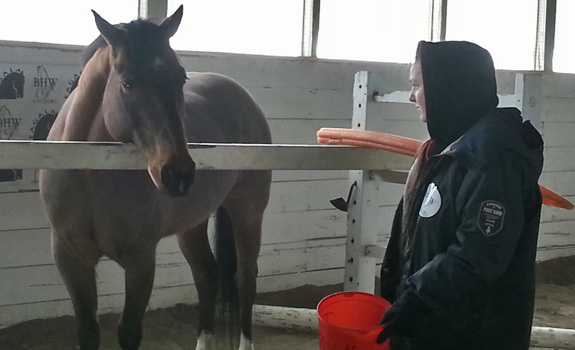 A soldier’s relationship with a horse can provide emotional insights and self-understanding,” she concluded. Berkshire HorseWorks’ professional team is composed of Massachusetts licensed social workers, psychologists, psychiatrists, and equine specialists who work in tandem with referring clinicians to achieve the highest efficacy in treatment. Programs take place on premises unless off-site sessions are requested. Additional fees may apply for transport.